There’s been a bit of discussion lately on deployment options. Much of the debate is centered around the relative merits of Heroku. We have some experience with Heroku and Amazon Web Services (AWS), so let’s dive into some comparisions. This is the only metric that counts for many clients, so it’s good to start here. The trouble with price comparisons is that no two services are exactly the same, so it’s hard to do an apples-to-apples comparison. So let’s see what we can get at the entry level. You can’t beat free, and this is actually quite a good offering. One dyno is plenty to run many kinds of apps. Brochure sites, simple APIs, and blogs are a few of the many possible uses for this free dyno. But to make the comparison fair, we need to know what this free dyno includes and what strings are attached. No other services can be run on dynos. Dynos are strictly for application processes. Databases, background workers, and other services usually cost extra through Heroku’s add-ons or third party services. No way to increase RAM, storage, or CPU performance. Additional storage must be hosted separately through a service such as Amazon S3. App performance can only be improved by increasing the number of running dynos. Heroku automatically load balances and routes visitors to all available dynos. No way to install system software. Heroku does provide some commonly-used packages such as Imagemagick, but if you need anything else, you’ll have to resort to hacks. Amazon Elastic Compute Cloud (Amazon EC2) is the closest equivalent to Heroku’s dynos. 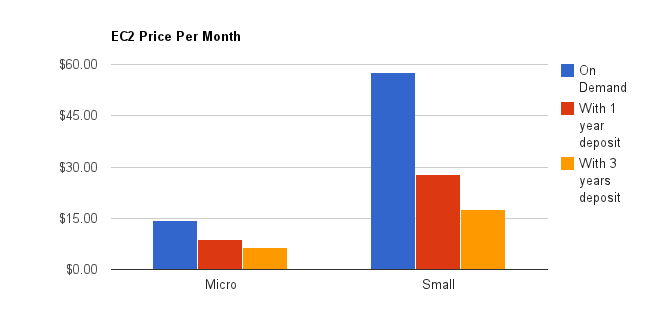 One EC2 micro instance is approximately equivalent in terms of RAM and compute power to one of Heroku’s dynos/workers. However, in our experience, the performance of a full-stack Rails application on a single micro EC2 instance is not quite as good as on a single Heroku dyno. This could be because we were running database and workers on the same instance. We could have probably slimmed down the instance by removing unnecessary system processes, but instead we typically go with a small EC2 instance. As you can see, EC2 is much cheaper when paid for in advance. Let’s just go with a one year heavy utilization reserved small instance for this comparison. $27.77 a month on average (after amortizing the deposit and paying for the usage over one year). Again, it’s hard to make a direct comparison, but some of these figures are considerably higher than Heroku’s (1600 times the storage space!). You have to deploy your application yourself, either through Chef recipes, Capistrano, or manually. You have to administer the system yourself. EC2 has machine images of popular distros such as Ubuntu that are easily launched, but after that it’s up to you to keep it up to date and secure. Scaling horizontally (i.e. launching multiple app instances) is not as easy as with Heroku where it’s just a matter of moving a slider on their web interface. You’d better get familiar with Chef if you want to scale up and down frequently. This seems like a big drawback but in practice we rarely adjust the number of running instances for an app. AWS is more expensive for the basic offering. There is a free tier that will give you one free micro instance for the first year (only available when you first sign up) but this is not as generous as Heroku’s free, unlimited, single dyno apps. $20 for increased database storage. Heroku’s free shared database only offers 5MB storage. They are rolling out a new option but it’s unclear what the specs are. $57.60 for an on-demand small EC2 instance (or $27.77 for a one year commitment; $17.69 for three years). With Amazon it’s easy from a pricing perspective to add or remove services. If you go with Heroku, you may have to ask your client for an additional monthly payment for each service you add, making the decision more difficult and time consuming. Besides costs, you will want to consider whether or not it’s even possible to run your application on Heroku before going that route. If you need to run custom binaries or compile from source, you will have to figure out how to hack Heroku, or you may be out of luck. If you need to store temporary files you should know that Heroku’s ephemeral file system does not make that task easy. You could end up exerting a lot of effort only to eventually run into a brick wall. Personally, I’ve had to hack gems and try to find workarounds for many Heroku-specific issues. On the other hand, if you know your application will fit within the limitations, deployment on Heroku is a breeze. The web interface is beautiful, the CLI client works well for the most part (except it can’t manage multiple Heroku accounts), and it’s easy to add other services through add-ons. But if you think your app’s needs might grow in ways that won’t be satisfied by simple horizontal scaling, you should definitely consider AWS. Of course, you can always start with Heroku and later migrate to AWS, but in that case you will have to configure your app for two environments and spend the time to migrate everything. In my experience, there are simply no other platforms that compare well with Heroku or AWS. There are some nice Heroku alternatives such as Dotcloud, but they suffer from coming after Heroku and thus having less integration with third-party products and less community support. Rackspace is the closest competitor to AWS, but it lacks the rich APIs and support that Amazon provides. Hopefully, we’ll see competitors catching up to Heroku and AWS and offering us more choices. Both Heroku and AWS are excellent platforms. They are quite different in some key areas. Understanding what each offers is essential to picking the right platform for your application. There is no clear winner here. Personally I like to use both. But my (simplified) mental test for which one to use is this: small app–Heroku; large app–Amazon. The winning platform is whichever one most helps you achieve your goals through keeping your developers happy and productive while remaining affordable enough to be sustainable. Editors note: Reed recently revisited the Heroku vs. AWS comparison. Smashing Boxes is a web and mobile app development company know for creating a lasting experience through bold design and disrupting the status quo. We are entrepreneurs and craftsmen first, and a digital creative agency second. Inspired by our visionary clients, we transform ideas into innovative web and mobile applications. Get in touch.